John Santos brings the filosofía Caribeña to Oakland. Local percussionist John Santos built a whole-life philosophy on his Caribbean heritage, despite being several generations removed. He grew up in San Francisco's Mission District with a Puerto Rican-American mother and a father from Cape Verde. His parents spoke English, but raised their children in a very Latino environment — the Mission, with its mixed population of Chicanos, Puerto Ricans, Columbians, Nicaraguans, and Salvadorians, was a microcosm of several Caribbean cultures. Santos learned Spanish by listening to his grandparents and by soaking up the music on his parents' record player. At age twelve he started playing conga in his grandfather's band, and launched a life-long love affair with Latin music. Twenty years since moving from the Mission to East Oakland, Santos remains one of the most respected bandleaders in town. He's collaborated with Omar Sosa, Santana, Bobby Hutcherson, and Danilo Perez. He's wooed audiences at La Peña Cultural Center with an arsenal of toy instruments (castinets, music boxes, sleigh bells). He's been nominated for five Grammies. And, he said, he constantly has a record in production: "I'm always going in the studio writing, mixing, and working on new projects. I always want to document it." Amazingly, Santos has very little formal training, save three years of clarinet lessons in elementary school. He operates on intuition. 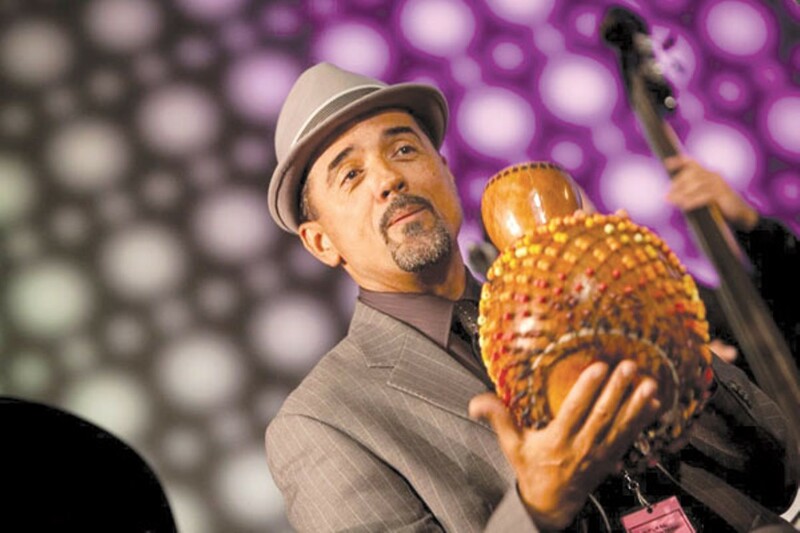 Santos' next project, Filosofía Caribena, will honor the African and Latino elements of Caribbean culture by combining a series of jazz compositions with spoken word and dance choreography. That mix of genres befits the theme, said Santos. After all, jazz is a Creole form that emerged from New Orleans — "a community that's been totally connected for centuries with all the major ports of the Caribbean." Santos' jazz sextet highlights the protean nature of the form, mixing be-bop influences, African percussion instruments, and Caribbean dance rhythms. He's recruited local emcee Rico Pabón for the spoken word component, also apropos of the filosofía (spoken word has its genesis in the oral tradition, but is most closely associated with contemporary hip-hop). It's a mixed bag, but Santos says that all of these art forms — poetry, rap, jazz, and Caribbean dance — are moored in the same African tradition. "The center of the Creole world is the Caribbean," Santos explained. "It has a nasty colonial history ... but it's given birth to people that are every color of the rainbow."